UNFCCC is an international treaty on environmental issues related to the world’s climate change. So what is the connection between UNFCCC and this website? Nothing, actually. I just a person who feels the effect of climate change, and have concern about this international movement on how to solve this global problem. I make this site to be a good starting point for people who want to know and learn about climate change issues and what the world has done (or tried to do) to solve it. This is my form of support to UNFCCC. Human activities has changed the world climate. To learn more, read the climate change article from Wikipedia. Countries in green color already become UNFCCC member. 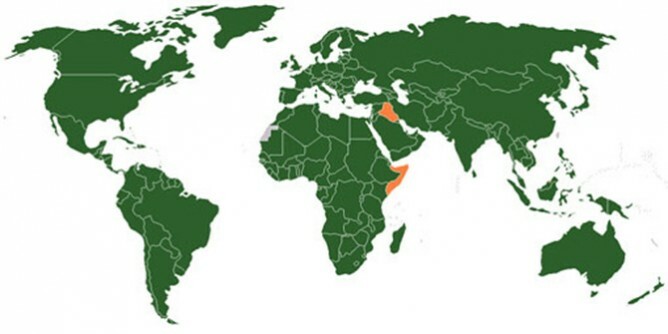 Countries in orange are UNFCCC observers. Countries in gray are not UNFCCC member. UNFCCC was formed during the meeting of UNCED (United Nations Conference on Environment and Development) in Rio de Janeiro, 1992. The main goal of UNFCCC is to reduce emissions of greenhouse gas in order to combat global warming. In 2007, there are 190 countries in the world already become UNFCCC member. The headquarter of UNFCCC is in Bonn, Germany, lead by Yvo de Boer as Executive Secretary since 2006. Starting from 1995, UNFCCC members conducted annual meeting called Conferences of the Parties (COP) to negotiate steps to be taken. The meeting was hosted in different countries every year. To learn more, read the UNFCCC article from Wikipedia and WHRC website.